China’s theatrical movie business has continued its decade long boom in 2011, with box office receipts through the end of October running 30 percent higher year-on-year than at the same point in 2010. At $1.6 billion for the year so far, China is surprisingly close behind Japan, and it appears increasingly likely that the People’s Republic will vault ahead next year to become the world’s 2nd largest film territory after the U.S. According to data from the State Administration of Radio, Film and Television (SARFT), China’s box office has increased by an average rate of nearly 40 percent annually since 2001, a pace more than four times faster than the country’s overall economic growth rate. Even if growth slows significantly, China will probably pass the U.S. within a decade to become the world’s most important film market. Chinese filmgoers have demonstrated a strong preference for Hollywood films over home-grown ones, with the 35 U.S.-made releases accounting for more than half of all box office receipts. Films from Chinese producers accounted for just 25 percent, and China-foreign co-productions—most of these made with Hong Kong partners—accounted for another 18 percent of revenues. 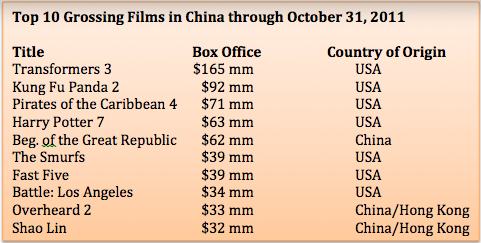 The average U.S. film grossed $22 million, while the average Chinese film grossed just $6 million. The market has broadened considerably this year, with 29 films having reached the 100 million RMB ($15 million) threshold so far, compared to 17 films for all of 2010. Leading the way are Transformers: The Dark Side of the Moon, at $165 million, and Kung Fu Panda 2 at $92 million. The highest grossing Chinese language film is the government-backed historical epic The Beginning of the Great Republic, at $62 million. 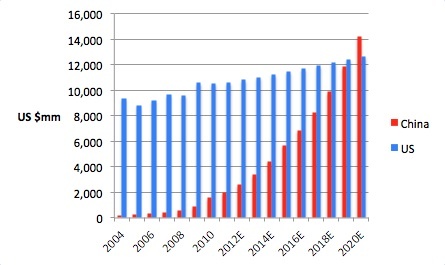 As in prior years, action-adventure, sci-fi and animation are the most popular genres in 2011, capturing almost two-thirds of total market share. Romances, comedies, thrillers, historical epics and dramas have been far less successful, with each of these genres drawing only about 5 to 7 percent of the market. 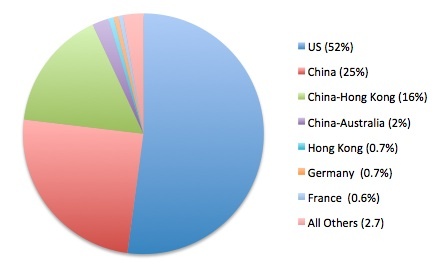 Among U.S. suppliers, Paramount is the clear leader in China this year, due mainly to the huge success of Transformers 3. Disney and Sony are neck and neck for 2nd place, with Warner Bros and Universal a bit further behind, and Fox last among the majors with only a 3 percent market share. Despite all the noise it has made about its China adventures, Relativity has generated almost no interest for its films among Chinese moviegoers, with less than 1 percent of the box office. Although American films are generating huge ticket sales, little of this money actually makes its way back across the Pacific. Under China’s quota system foreign-made films receive only modest flat-fee deals or, at best, about 15 percent of total receipts for those lucky enough to get one of the 20 annual revenue-share slots. So from the roughly $800 million in Chinese box office receipts earned so far in 2011 by Hollywood movies, just $100 million or so will go to their U.S. suppliers, with theater operators and major Chinese distributors China Film Group and Huaxia keeping the rest. Given China’s massive potential and anemic growth in the U.S. market, it is surprising to note how little Hollywood’s studios have done to position themselves in what will soon be the world’s largest movie territory. None have mounted serious co-production operations, and tiny Hong Kong will likely earn more in China this year than all of Hollywood’s producers combined. A void exists in the market, a shortage of quality films and the expertise to make them. Hollywood can fill that void. Of course, the Communist party administrators who oversee China’s film industry aren’t exactly eager to see Hollywood further extend its dominance over their cultural industries. Americans who wish to stake a claim in China’s movie gold rush will do well to get in now while it is still early, and to invest in building bridges with government officials, distributors, and others who hold the keys to the middle kingdom’s burgeoning box office riches. Rob Cain is a film producer and entertainment consultant who has been doing business in China since 1987. Rob can be contacted at rob@pacificbridgepics.com. This entry was posted in Box Office Reports, General News and tagged Animation in China, China box office, China box office share by country, China box office share by genre, China film, China Film Group, Huaxia, Rob Cain, Robert Cain by chinafilmbiz. Bookmark the permalink. estave Good post, thank you. Do you have a Twitter account? Great analysis and exciting to read! It does however fall in line with the ideology of having no “superstar” talent emerge to become wealthy and powerful and less controllable. I have a feature film screenplay adapted from my novel The Color of Ice 冰的颜色, which deals with trust, racial issues and multi-cultural romance. This appeals to most westerners, has no martial arts, and portrays Chinese as intelligent, professional, open minded and compassionate individuals. My young adult mysteries appeal to those who love a contemporary “Nancy Drew” now as Becky Bing, a feisty, bright, teenager, who could serve as a role model from Beijing to Boston. Hook Island 胡克岛 and the sequel Summer Games 夏季游戏 will are in script development now. My purpose was to bridge EAST and WEST beginning at an earlier age (and beyond).